Day two of Les Voiles de Saint-Tropez regatta started with less than stellar conditions with the breeze just around four knots. After the competing yachts waited around a few hours for the breeze to begin to build, the race committee set the first warning signal for 1300 local time. Both the J Class yachts and the Wallys ideally need at least five knots to race. The J Class yachts got a start at 1310 when the breeze picked up, and in this fleet Lionheart was the star of Day 2, crossing the finish line with a time of 1:21’:38’’ followed by Hanuman, which was behind her only by 57 seconds. Velsheda and Shamrock took the 3rd and 4th place, respectively. For day two, the Wally class superyachts battled in two races. Open Season finished Race 3 with a superb time of 1:17’:45’’ followed by supeyacht J One and Magic Carpet3. The scoreboard still stands with J One in the lead in the Wally Class followed by Open Season, but now Magic Carpet3 is in third place standings just ahead of fellow WallyCento yacht Hamilton. 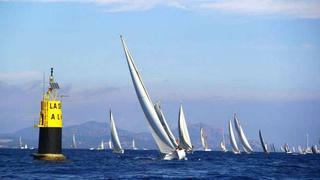 On Day 2, the classics took to the water, making a delightful mix to the scene set by the modern yachts. Moonbeam IV lead the scoreboard in the Grands Tradition Class, followed by Mariska and Marquita.